In line 2, we access the $form variable passed from the controller's action. In line 3, we call the Form's prepare() method to prepare the form for rendering. Please note that calling this method is very important. If you forget to do that, there may be some undesired rendering problems. In line 6, we call the openTag() method of the Form view helper. Its purpose is to render the opening <form> tag and its attributes. The method takes a single argument -- an instance of the form model. Paired closing </form> tag is rendered in line 22 with the help of the closeTag() method of the Form view helper. In lines 8-10, we render the E-mail field's label, the text field itself and (possible) validation errors with the help of the FormLabel, FormElement and FormElementErrors view helpers. Those helpers take the instance of the form model's element as a single argument. We get an instance of the element with the get() method provided by the Form base class. In lines 12-14, by analogy, we render the Subject field, its label and validation errors. And in lines 16-18, we render the label, the field and the validation errors for the body text area field. 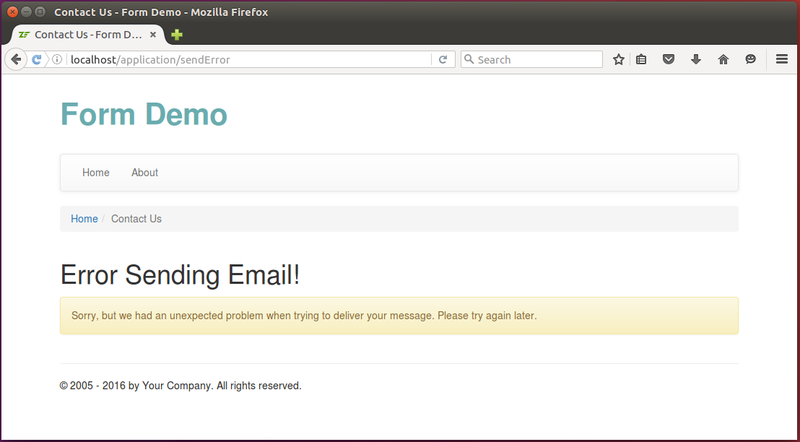 In line 20, we render the Submit button. In the code above, we mostly used the FormElement, FormElementErrors and FormLabel view helpers. You may use the generic FormRow or Form view helpers if you want to reduce the amount of code to write, but this may result in less control of form decoration. In the code above, we added the .form-control CSS class to every input field in the form. We did that with the setAttribute() method (see lines 5, 10 and 15). With that method, we also added the "placeholder" attribute to define the nice-looking placeholder text when a field is empty. For the "body" field, we added the "rows" attribute defining the height of the field (6 rows). For the form's Submit button, we use the .btn and .btn-primary CSS classes (see line 21). We also put label-input pairs inside of <div> elements with .form-group CSS class (lines 35, 41, 47). We put a form inside of the 6-column-width grid cell, which makes the form half the width of the screen (look at lines 31-32). Sometimes it is impossible to use Twitter Bootstrap styling with standard ZF3 form view helpers. For example, standard view helpers FormCheckbox and FormRadio can't be tweaked to support Bootstrap styles. Fortunately, there is a third-party module neilime/zf2-twb-bundle that you can install with Composer (do not be confused with module's name - it supports ZF3 as well). This module provides convenient view helpers for rendering ZF3 forms and applying Bootstrap styling to them. It works transparently, so once you installed the module, standard ZF3 form view helpers become replaced with module-provided form view helpers, so you don't need to change your view template code. 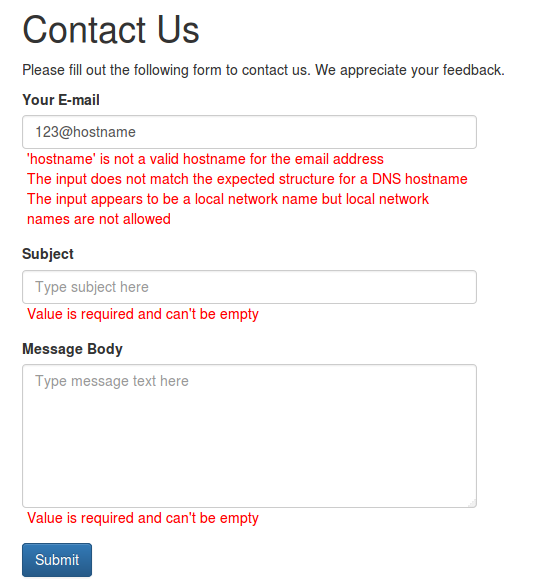 The CSS rules above will remove bullets from the list and make validation error messages appear in red. 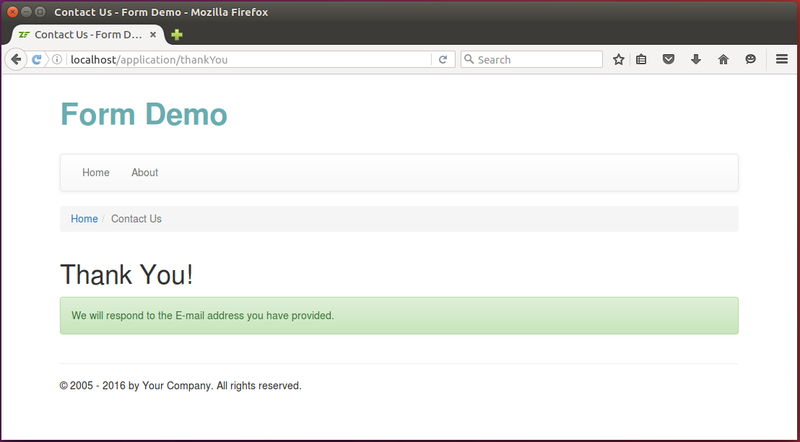 The last small thing we will do is preparing the view templates for the "Thank You" and "Error Sending Email" pages. We will respond to the E-mail address you have provided. your message. Please try again later. Congratulations! Now, if you open the "http://localhost/contactus" URL in your web browser, you should see a page like that shown in figure 7.20. If you enter some invalid data in the form and click the Submit button, you should see the validation errors (figure 7.21). Entering the correct E-mail, subject and message text and submitting the form results in sending the message and displaying the Thank You page (see figure 7.22). 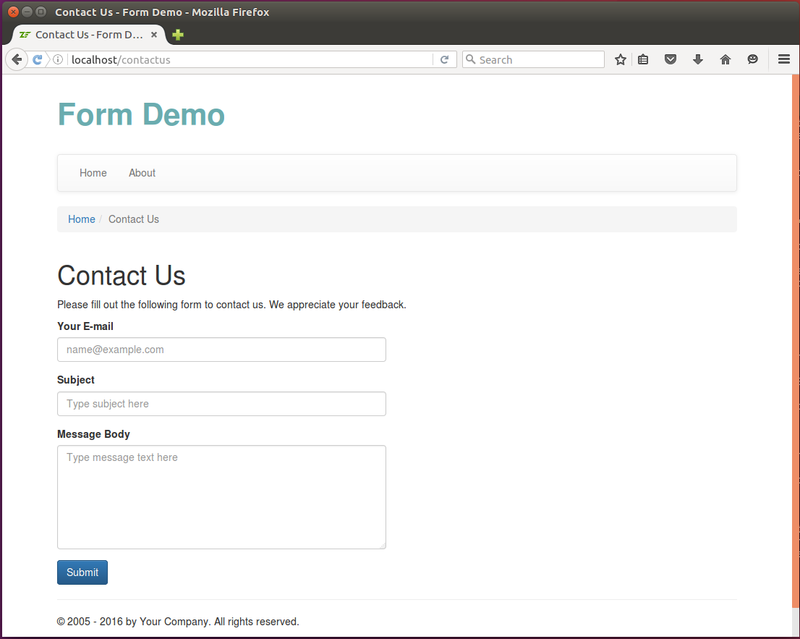 You can see the Contact Us form in action in the Form Demo sample application bundled with this book.